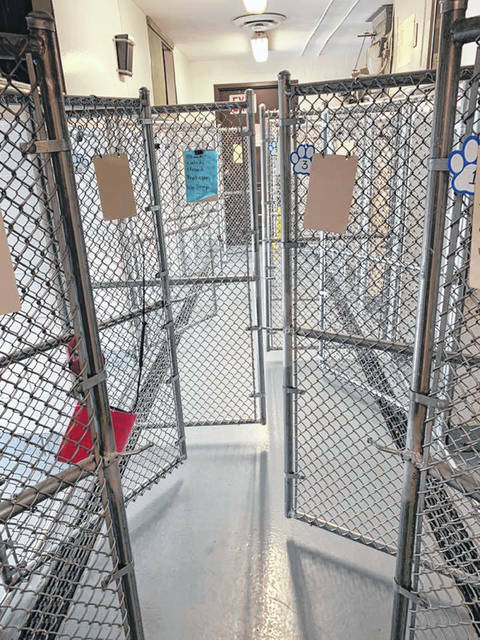 Photo courtesy GCAC The last dogs at Greene County Animal Care & Control were adopted over the weekend, leaving the kennels temporarily empty. XENIA — As of press time Feb. 4, the dog adoption kennels at Greene County Animal Care & Control are empty. Holmes-Taylor said all of the dogs were adopted late last week and over the weekend. She said there will be no dogs up for adoption until later this week. Residents and potential adopters can stay up-to-date on available pets at GCAC by following their Facebook page, checking “adoptions” on the county’s Animal Control webpage, or flipping to Pets of the Week featured consistently in the Gazette and Herald. https://www.xeniagazette.com/wp-content/uploads/sites/32/2019/02/web1_Kennel.jpgPhoto courtesy GCAC The last dogs at Greene County Animal Care & Control were adopted over the weekend, leaving the kennels temporarily empty.